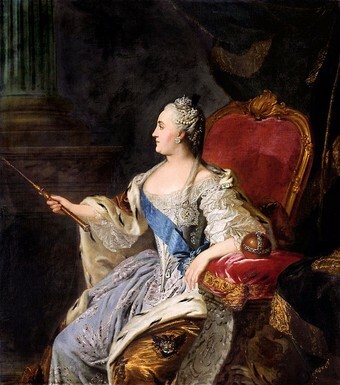 Catherine the Great enthusiastically supported the ideals of the Enlightenment, thus earning the status of an enlightened despot, although her reforms benefited a small number of her subjects and did not change the oppressive system of Russian serfdom. The period of Catherine’s rule (1762-1796), the Catherinian Era, is often considered the Golden Age of the Russian Empire and Russian nobility. She enthusiastically supported the ideals of the Enlightenment, thus earning the status of an enlightened despot. An admirer of Peter the Great, Catherine continued to modernize Russia along Western European lines. However, military conscription and economy continued to depend on serfdom, and the increasing demands of the state and private landowners led to increased levels of reliance on serfs. Consequently, the unrest intensified and more than fifty peasant revolts occurred between 1762 and 1769. These culminated in Pugachev’s Rebellion, the largest peasant revolt in Russia’s history. Catherine believed a “new kind of person” could be created by inculcating Russian children with European education. However, despite the experts’ recommendations to establish a general system of education for all Russian Orthodox subjects from the age of 5 to 18, excluding serfs, only modest action was taken. An estimated 62,000 pupils were educated in some 549 state institutions near the end of Catherine’s reign, a minuscule number of people compared to the size of the Russian population. Catherine converted to the Russian Orthodoxy as part of her immersion in the Russian matters but personally remained largely indifferent to religion. Her religious policies aimed to control populations and religious institutions in the multi-religious empire and were not an expression of religious freedom. Catherine did not advocate democratic reforms but addressed some modernization trends, including dividing the country into provinces and districts, further increasing the power of the landed oligarchs, and issuing the Charter of the Towns, which distributed all people into six groups as a way to limit the power of nobles and create a middle estate. Catherine had a reputation as a patron of the arts, literature, and education. She cultivated and corresponded with French encyclopedists but did not support a free-thinking spirit among her own subjects as much as among famous French philosophers. Also known as enlightened absolutism or benevolent absolutism, a form of absolute monarchy or despotism inspired by the Enlightenment. The monarchs who embraced it followed the participles of rationality. Some of them fostered education and allowed religious tolerance, freedom of speech, and the right to hold private property. They held that royal power emanated not from divine right but from a social contract whereby a despot was entrusted with the power to govern through a social contract in lieu of any other governments. A 1773-75 revolt in a series of popular rebellions that took place in Russia after Catherine II seized power in 1762. It began as an organized insurrection of Cossacks against a background of profound peasant unrest and war with the Ottoman Empire. It was the largest peasant revolt in Russia’s history. A museum of art and culture in Saint Petersburg, Russia. One of the largest and oldest museums in the world, it was founded in 1764 by Catherine the Great and has been open to the public since 1852. Its collections, of which only a small part is on permanent display, comprise over three million items. A group of predominantly East Slavic-speaking people who became known as members of democratic, self-governing, semi-military communities, predominantly located in Ukraine and in Russia. They inhabited sparsely populated areas and islands in the lower Dnieper, Don, Terek, and Ural river basins and played an important role in the historical and cultural development of both Russia and Ukraine. Russia’s first educational establishment for women, established under Catherine the Great’s rule, that continued to function under the personal patronage of the Russian Empress until just before the 1917 revolution. The period of Catherine’s rule (1762-1796), the Catherinian Era, is often considered the Golden Age of the Russian Empire and the Russian nobility. She enthusiastically supported the ideals of the Enlightenment, thus earning the status of an enlightened despot. As such, she believed that strengthening her authority had to occur by improving the lives of her subjects. This philosophy of enlightened despotism implied that the sovereign knew the interests of his or her subjects better than they themselves did. The monarch taking responsibility for the subjects precluded their political participation. Portrait of Empress Catherine the Great by Russian painter Fyodor Rokotov, 1763.Catherine reformed the administration of Russian guberniyas and many new cities and towns were founded on her orders. An admirer of Peter the Great, she continued to modernize Russia along Western European lines although her reforms did not benefit the masses and military conscription and economy continued to depend on serfdom. An admirer of Peter the Great, Catherine continued to modernize Russia along Western European lines. However, military conscription and economy continued to depend on serfdom, and the increasing demands of the state and private landowners led to increased levels of reliance on serfs. Catherine confirmed the authority of the nobles over the serfs in return for the nobles’ political cooperation.This was one of the chief reasons behind ongoing rebellions. The unrest intensified as the 18th century wore on, with more than fifty peasant revolts occurring between 1762 and 1769. These culminated in Pugachev’s Rebellion, when,between 1773 and 1775, Yemelyan Pugachev rallied the peasants and Cossacks and promised the serfs land of their own and freedom from their lords. In the 18th century, the peasantry in Russia were no longer bound to the land, but tied to their owners, which made Russian serfdom more similar to slavery than any other system of forced labor that existed at the time in Europe. A landowner could punish his serfs at his discretion and under Catherine the Great gained the ability to sentence his serfs to hard labor in Siberia, a punishment normally reserved for convicted criminals. The only thing a noble could not do to his serfs was to kill them. The life of a serf belonged to the state. Historically, when the serfs faced problems they could not solve (such as abusive masters), they appealed to the autocrat. They continued doing so during Catherine’s reign though she signed legislation prohibiting the practice. While she eliminated some ways for people to become serfs, culminating in a 1775 manifesto that prohibited a serf who had once been freed from becoming a serf again, she also restricted the freedoms of many peasants. During her reign, Catherine gave away many state-owned peasants to become private serfs (owned by a landowner). Pugachev launched the rebellion in mid-September 1773. He had a substantial force composed of Cossacks, Russian peasants, factory serfs, and non-Russians. Despite some victories, by late 1774 the tide was turning, and the Russian army’s victory at Tsaritsyn left 9,000 to 10,000 rebels dead. By early September, the rebellion was crushed. Pugachev was betrayed by his own Cossacks when he tried to flee and he was beheaded and dismembered in 1775 in Moscow. Catherine believed a “new kind of person” could be created by inculcating Russian children with European education. However, despite the experts’ recommendations to establish a general system of education for all Russian Orthodox subjects from the age of 5 to 18, excluding serfs, only modest action was taken. The Moscow Foundling Home (Moscow Orphanage), charged with admitting destitute and extramarital children, was created to experiment with new educational theories. However, due to extremely high mortality rates, it failed to serve that purpose. 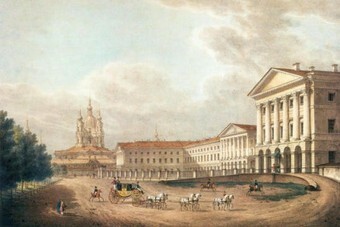 Shortly after the Moscow Foundling Home, Catherine established the Smolny Institute for Noble Girls to educate females. The girls who attended the Smolny Institute, Smolyanki, were often accused of being ignorant of anything that went on outside the walls of the Smolny buildings. Within the walls of the Institute, they were taught impeccable French, musicianship, dancing, and complete awe of the Monarch. The Smolny Institute, the first Russian Institute for Noble Maidens and the first European state higher education institution for women, by S.F. Galaktionov, 1823. The building was commissioned from Giacomo Quarenghi by the Society for Education of Noble Maidens and constructed in 1806–08 to house the Smolny Institute for Noble Maidens, established at the urging of Ivan Betskoy and in accordance with a decree of Catherine in 1764. The establishment of the institute was a significant step in making education available for females in Russia. Catherine introduced some educational reforms despite the lack of a national school system. The remodelling of the Cadet Corps in 1766 initiated many educational reforms. The Corps began to take children from a very young age and educate them until the age of 21, and the curriculum was broadened from the professional military curriculum to include the sciences, philosophy, ethics, history, and international law. In 1786, the Russian Statute of National Education was promulgated. The statute established a two-tier network of high schools and primary schools in guberniya capitals that were free of charge, open to all of the free classes (not serfs), and co-educational. Two years after the implementation of Catherine’s program, a member of the National Commission inspected the institutions established. Throughout Russia, the inspectors encountered a patchy system. While the nobility put up appreciable amounts of money for these institutions, they preferred to send their children to private, more prestigious institutions. Also, the townspeople tended to turn against the junior schools and their pedagogical methods. An estimated 62,000 pupils were educated in some 549 state institutions near the end of Catherine’s reign, a minuscule number of people compared to the size of the Russian population. Catherine converted to the Russian Orthodoxy as part of her immersion in the Russian matters but personally remained largely indifferent to religion. Her religious policies largely aimed to control populations and religious institutions in the multi-religious empire. She nationalized all of the church lands to help pay for her wars, largely emptied the monasteries, and forced most of the remaining clergymen to survive as farmers or from fees for services. However, in her anti-Ottoman policy, she promoted the protection and fostering of Christians under Turkish rule. Although she placed strictures on Roman Catholics in the Polish parts of her empire, Russia also provided an asylum to the Jesuits following their suppression in most of Europe in 1773. Catherine took many approaches to Islam during her reign but her pro-Islam policies were all an attempt to control Muslim populations in the empire. After the Toleration of All Faiths Edict of 1773, Muslims were permitted to build mosques and practice freely. In 1785, Catherine approved the subsidization of new mosques and new town settlements for Muslims. By building new settlements with mosques placed in them, Catherine attempted to ground many of the nomadic people who wandered through southern Russia. In 1786, she assimilated the Islamic schools into the Russian public school system to be regulated by the government. The plan was another attempt to force nomadic people to settle. Russia often treated Judaism as a separate entity and Jews were under a separate legal and bureaucratic system. After the annexation of Polish territories, the Jewish population in the empire grew significantly. Catherine levied additional taxes on the followers of Judaism, but if a family converted to the Orthodox faith that additional tax was lifted. In 1785, she declared Jewish populations to be officially foreigners, with foreigners’ rights. Catherine’s decree also denied them the rights of Orthodox or naturalized citizens of Russia. Taxes doubled again for those of Jewish descent in 1794 and Catherine officially declared that Jews bore no relation to Russians. Catherine did not advocate democratic reforms but addressed some of the modernization trends. In 1775, she decreed a Statute for the Administration of the Provinces of the Russian Empire. The statute sought to efficiently govern Russia by increasing population and dividing the country into provinces and districts. In 1785, she conferred on the nobility the Charter to the Nobility, increasing further the power of the landed oligarchs. Nobles in each district elected a Marshal of the Nobility, who spoke on their behalf to the monarch on issues of concern to them, mainly economic ones. In the same year, Catherine issued the Charter of the Towns, which distributed all people into six groups as a way to limit the power of nobles and create a middle estate. Catherine had a reputation as a patron of the arts, literature, and education. The Hermitage Museum, which now occupies the whole Winter Palace, began as Catherine’s personal collection. Within a few months of her accession in 1762, having heard the French government threatened to stop the publication of the famous French Encyclopédie on account of its irreligious spirit, Catherine proposed to Diderot that he should complete his great work in Russia under her protection.She wrote comedies, fiction, and memoirs while cultivating the French encyclopedists, who later cemented her reputation in their writings. Catherine enlisted Voltaire to her cause,and corresponded with him for 15 years, from her accession to his death in 1778. During Catherine’s reign, Russians imported and studied the classical and European influences that inspired the Russian Enlightenment. She also became a great patron of Russian opera. However, she did not support a free-thinking spirit among her own subjects as much as among the famous French philosophers. When Alexander Radishchev published his Journey from St. Petersburg to Moscow in 1790 (one year after the start of the French Revolution) and warned of uprisings because of the deplorable social conditions of the peasants held as serfs, Catherine exiled him to Siberia. “Pugachev’s Rebellion.” https://en.wikipedia.org/wiki/Pugachev%27s_Rebellion. Wikipedia CC BY-SA 3.0. “Smolny Institute.” https://en.wikipedia.org/wiki/Smolny_Institute. Wikipedia CC BY-SA 3.0. “Cossacks.” https://en.wikipedia.org/wiki/Cossacks. Wikipedia CC BY-SA 3.0. “Hermitage Museum.” https://en.wikipedia.org/wiki/Hermitage_Museum. Wikipedia CC BY-SA 3.0. “Catherine the Great.” https://en.wikipedia.org/wiki/Catherine_the_Great. Wikipedia CC BY-SA 3.0. “Enlightened absolutism.” https://en.wikipedia.org/wiki/Enlightened_absolutism. Wikipedia CC BY-SA 3.0. “Profile_portrait_of_Catherine_II_by_Fedor_Rokotov_1763_Tretyakov_gallery.jpg.” https://en.wikipedia.org/wiki/Catherine_the_Great#/media/File:Profile_portrait_of_Catherine_II_by_Fedor_Rokotov_(1763,_Tretyakov_gallery).jpg. Wikipedia Public domain. “Galaktionov_Smolny_institute_1823 1.jpg.” https://en.wikipedia.org/wiki/Catherine_the_Great#/media/File:Galaktionov_Smolny_institute_1823.jpg. Wikipedia Public domain.